The Senate has departed Washington for a Memorial Day weekend break, leaving on the table an immigration reform bill that would make extensive changes to the current immigration system, including legalizing millions of illegal immigrants. The legislators will be going home to an electorate that, by and large, is supportive of the bill — regardless of political leaning. A new CBS News/New York Times Poll finds most Americans surveyed support measures contained in the bill, including a guest worker program and the possibility of permanent residency for illegal immigrants who have lived and worked in the U.S. About half support changing the immigration system to give priority to immigrants based on background rather than family ties. Unlike other issues (like the war in Iraq) which typically have reflected partisan polarization, support from the public for these reforms is, for the most part, bipartisan. Most Americans are highly critical of current U.S. immigration policy, especially when it comes to illegal immigration. Half thinks that current immigration policy has so much wrong with it that it needs to be completely rebuilt. Almost as many see it as needing fundamental changes; few think just minor changes are needed. Illegal immigration is a particular concern; 61% think it is a very serious problem, and another 30% think it is somewhat serious. Concern about the issue has risen in the past few months, from 56% in January. In part, this may be because so many see illegal immigration as widespread. The majority of Americans ¬— three in four — believe that most of the people who have come to the United States in the last few years are in the country illegally. Just 16% think most are here legally. Americans have a positive impression of immigrants generally. When asked without reference to immigrants' legality, majorities of Americans say immigrants contribute to this country and work as hard, or harder, than people born here. However, illegal immigrants are viewed particularly negatively: 70% think they weaken the economy because they use public services but don't all pay taxes; 45% think that terrorism against the U.S. has increased as a result of illegal immigration. Americans point to the government as not addressing that issue adequately. More then four in five — 82% — think the U.S. could be doing more along its borders to keep illegal immigrants from crossing over into the U.S.; just 14% think the U.S. is now doing all it can. Is The U.S. Doing All That Can Be Expected To Keep Illegal Immigrants Out? Nearly four in five Americans have heard or read at least some about changing U.S. immigration laws, including 26% who have heard or read a lot. Some critics have described the current bill as providing "amnesty" to illegal immigrants, but most Americans would allow people who are in the country illegally to keep their jobs and try to become legal U.S. residents. Sixty-two percent of Americans say illegal immigrants who have lived and worked in the U.S. for at least two years should be given a chance to keep their jobs and apply for legal status. Just 33% think such people should be deported. This approach is supported by majorities of both Democrats (66%) and Republicans (61%). Two-thirds (67%) also support a more specific proposal to offer illegal immigrants a visa, contingent on meeting certain requirements. 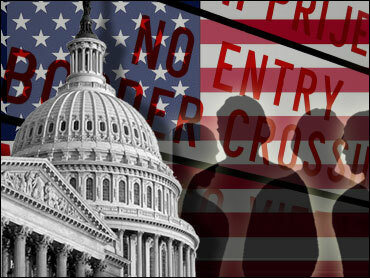 Sixty-seven percent favor allowing illegal immigrants to apply for a four-year visa that could be renewed, as long as they pay a fine, have a good work record and pass a criminal background check; 28% oppose this. Again, support runs across party lines; 66% of Republicans and 72% of Democrats favor it. But no jumping ahead in line: Most of those who support this proposal think illegal immigrants who apply for visas should have to wait until all legal applicants have been considered first. Most Americans accept a guest worker type of program, despite the political controversy over this component of the proposed legislation. Two-thirds (66%) support creating a guest worker program that would allow people from other countries to work in the U.S. for a temporary period of time; 30% oppose that. Both Democrats (64%) and Republicans (70%) favor such a program. Among those who favor a guest worker program, more than half would support allowing such workers to become permanent residents eventually if they have good employment records and have not committed any crimes. Just 38% would prefer that the workers return home once their allowed work period expires. There is no consensus, however, on what the impact of a guest worker program might be on illegal immigration. Forty-five percent think illegal immigration would increase as a result of a guest worker program, while 41% think it would decrease. One of the reasons Americans may accept many of these proposals is that they view the U.S. economy as doing pretty well. Although just 11% believe the economy is getting better, 44% say it is staying the same. Just one in 5 would like to see the number of visas issued to specialized workers from other countries increased. A similar percentage would like to see the number of such visas issued decreased, and nearly half want them kept at the present level. The public is somewhat receptive to another change: giving priority to immigrants based on their background instead of whether they already have family in the U.S. More than half (51%) support giving priority to immigrants based on their education, job skills and work experience, while 34% say that priority should be given to family members of immigrants already in the U.S.
Republicans are firmly behind giving priority to immigrants based on their background rather than family ties, while Democrats are divided. The legislation would also raise the fines levied on employers who hire illegal immigrants, and a majority of Americans approve: 75% favor increasing enforcement of laws about hiring illegal immigrants and the size of the fines for employers who do so. Just 8% are opposed. Majorities of both Republicans and Democrats favor this proposal. But Americans are divided on creating a federal database that would include everyone in the country who wants to work (immigrants and U.S. citizens), which employers would access before hiring an employee to determine whether the person is in the country legally: 45% think this is a good idea, while 49% think it is a bad idea. Slightly more than half of Republicans say this is a good idea, while a similar percentage of Democrats think it is a bad idea. There is also uncertainty about whether the government should issue identification cards to workers; half says they don't know enough about that to have an opinion: 35% think that's a good idea, while 15% think it is a bad idea. While many Americans favor programs that would allow illegal immigrants to attain some measure of legality, at the same time many also take a hard line about those who break the law. Sixty-nine percent think that illegal immigrants should be prosecuted and deported for simply being in the U.S. illegally; just one in four think they should not be. Majorities of both Democrats and Republicans share this view. The proposed immigration bill would both increase the size of the border patrol along the U.S.-Mexico border and provide for a fence in certain areas. Most Americans think increasing the Border Patrol is the more effective means of stopping illegal immigration: 68% think increased border patrols would be most effective, while just 15% opt for more fences. In most Americans' minds, most illegal immigrants come from Mexico — three-quarters volunteer that as the case. When it comes to reducing illegal immigration from that country, Americans would prefer negotiating with the Mexican government in order to increase border security over increasing trade with Mexico. This poll was conducted among a random sample of 1,125 adults nationwide, interviewed by telephone May 18-23, 2007. The error due to sampling for results based on the entire sample could be plus or minus three percentage points. The error for subgroups is higher. An oversample of African Americans was also conducted for this poll, for a total of 192 interviews among this group. The results were then weighted in proportion to the racial composition of the adult population in the U.S. Census. The margin of error for African Americans is plus or minus 7 percentage points.